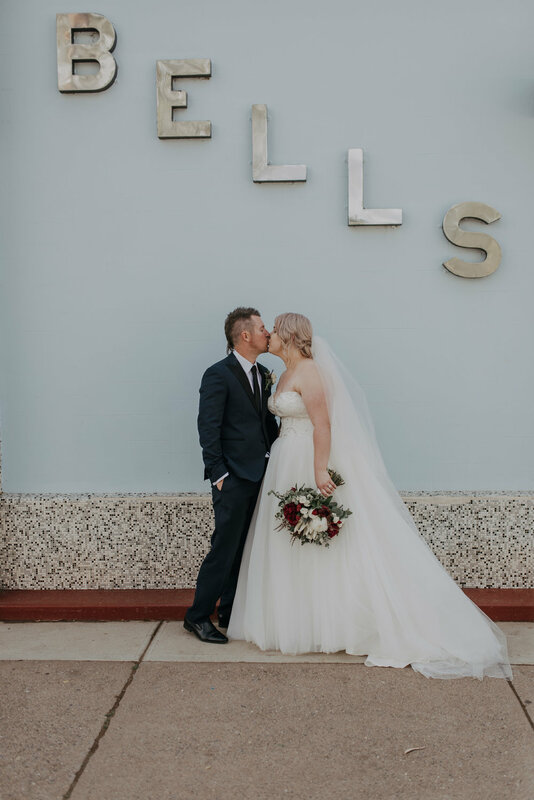 Paige and Daniel Bell were married in Broken Hill on the 4th November 2017. 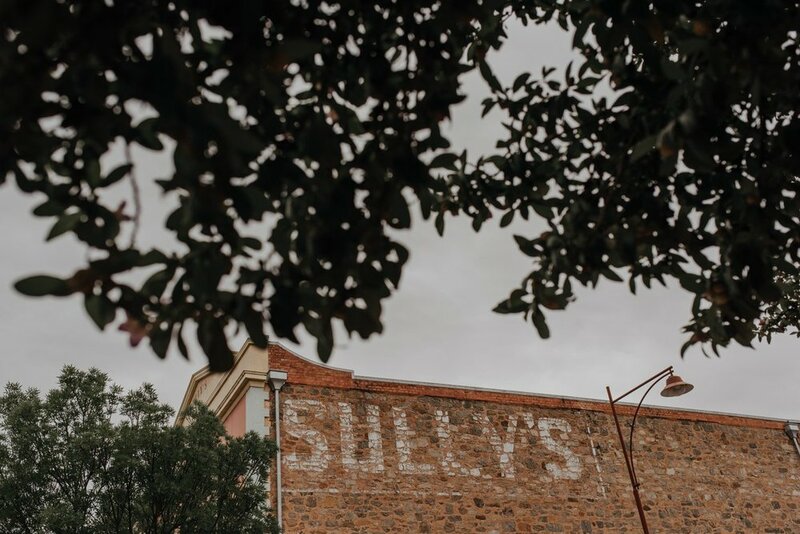 It's said that rain on your wedding day is a sign of good luck, and the day started out very overcast, windy and raining, but spoiler alert I'll skip right ahead and let you know that it cleared up at the most perfect moment right before the ceremony was due to begin. Now no newly wed couple would ever turn away a bit of good luck - but if there's one couple that doesn't need it, I'm sure it's Paige and Daniel. These two are so much on the same page and work together beautifully as a great little team. 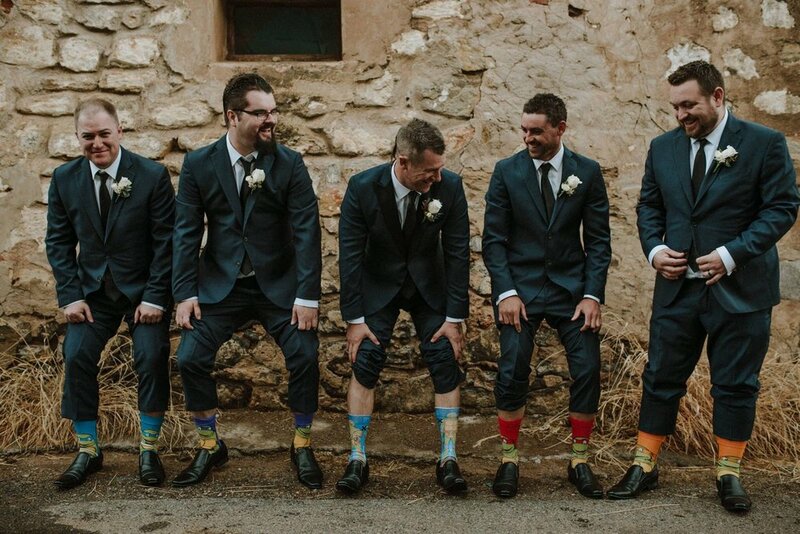 They had a vision for their special day and pulled it all together so well. Paige wanted an unstructured bouquet and her dream bloom was White King Proteas, as with all Brides I like to let them know that as we are dealing with a product of nature, unfortunately sometimes it can be the case that some blooms or foliage's are just not available on their chosen date. Leading up to Paige's date it was looking like we weren't going to be able to get our hands on these big beautiful proteas, and it was such a pleasure to be able to surprise Paige on the week and let her know that we could indeed include them for her. 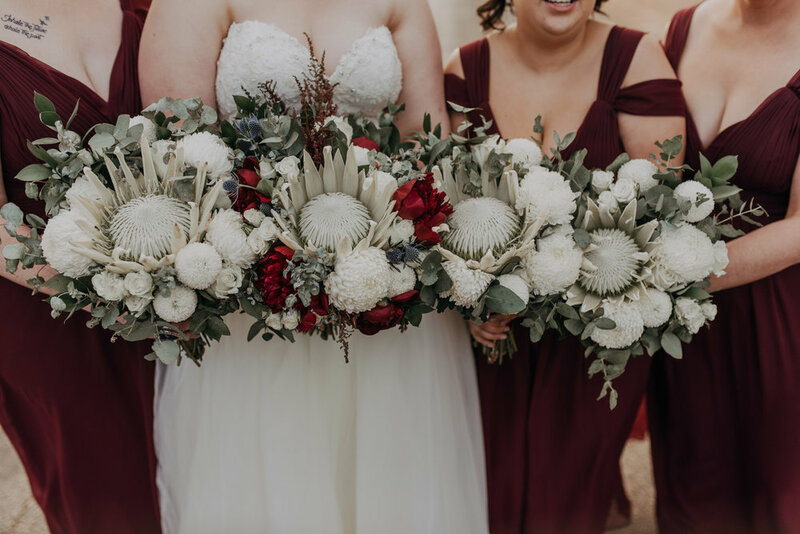 We also included in Paige's bouquet big crimson Peony's which were just beginning their season in Australia, imported Astilbe and Seaholly and then local Roses, Ping Pongs, Tetragona Nuts and Bluegum foliage. For the bridesmaids Paige opted for a white and green theme in the same style, which looked amazing with the girls gorgeous dresses. 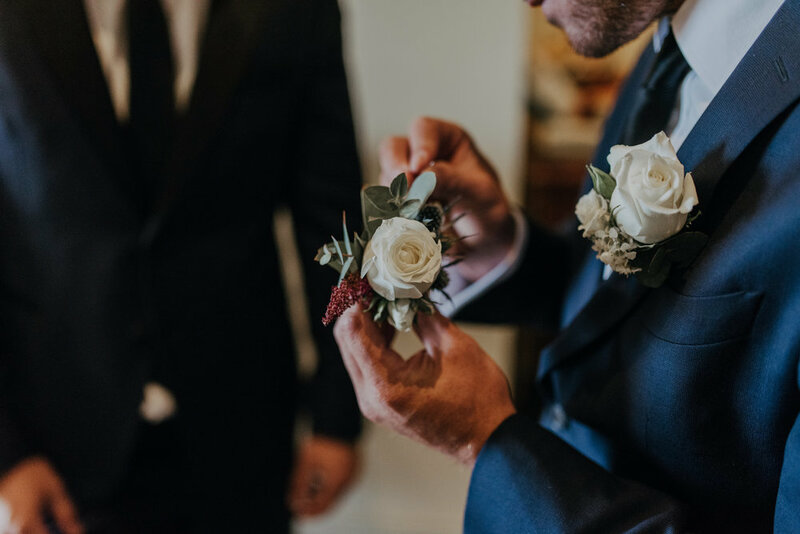 For the boys we did simple white rose buttonholes with small details of Amaranthus, Bluegum and Waxflower. At the ceremony and reception venue (Gary Radford Pavilion) we installed a beautiful welcome sign, table centrepieces, seating chart and ceremony arbour. The weather certainly proved to be a hindrance to the construction of the arbour - and I'm forever grateful to my little helpers Stelle and Erin for braving the rain and cold to pass me flowers on the ladder. 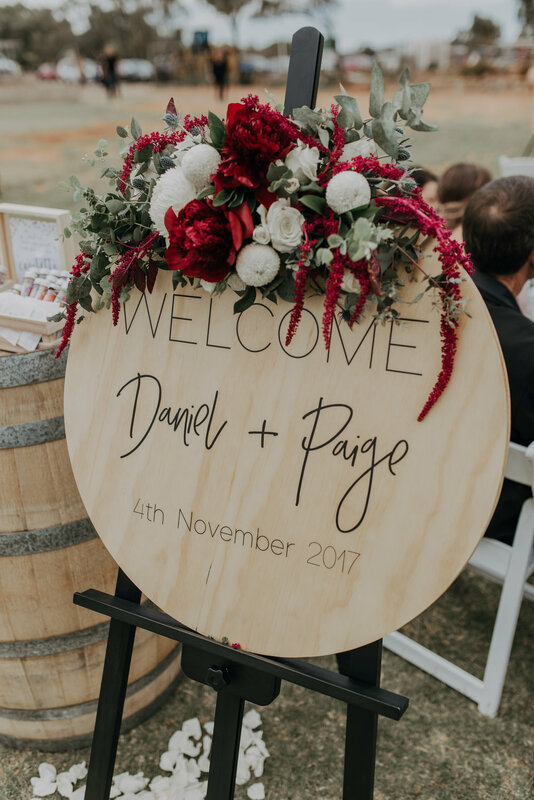 Stunning signage from Fast Print Studio really pulled everything together - I loved the typography Paige and Daniel selected for their seating chart, table numbers and welcome sign. 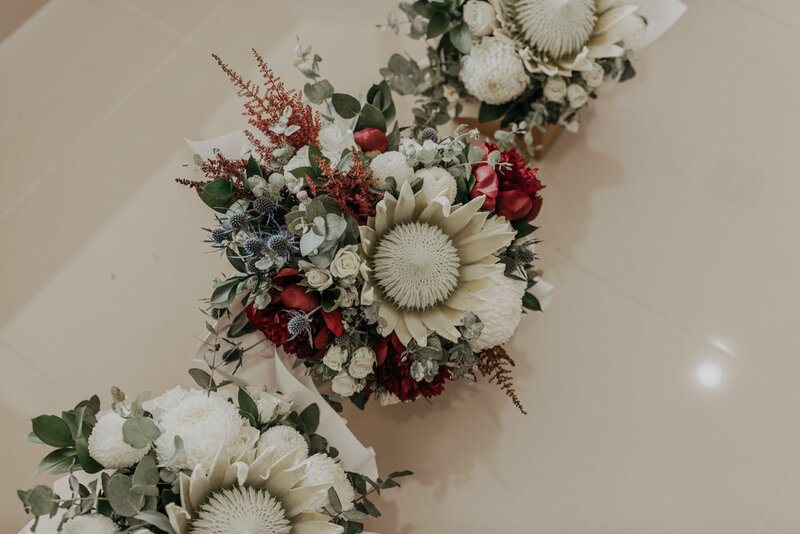 Each of the reception tables had a mason jar of Bluegum foliage and Gypsophilia, a really simple and effective way of brining warmth to a table. 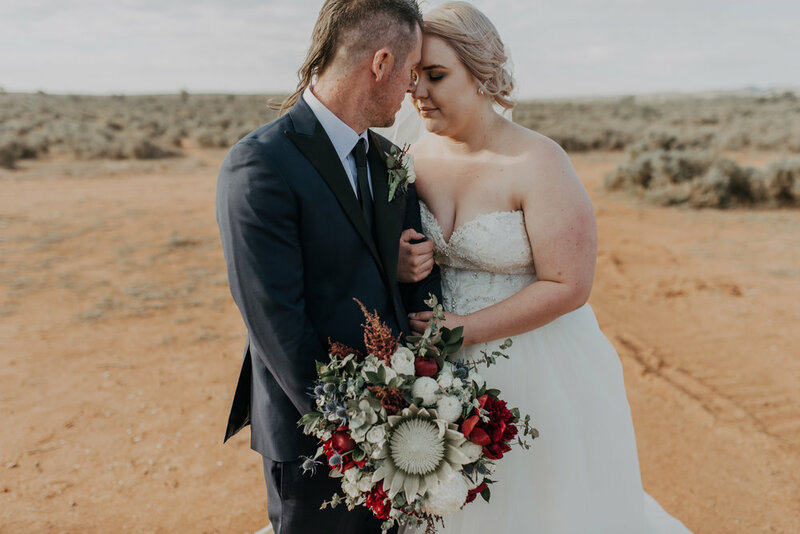 One of my favourite things Paige and Daniel incorporated into their day was their own Ice Cream Stand, something so different and nothing I've seen in Broken Hill before - it definitely would have been a sweet treat for their guests (sorry about the pun, would be rude not too). I also loved how they incorporated Daniel's love of the Teenage Mutant Ninja Turtles, in little touches with the boys outfits and even a sneaky part of the wedding cake. Paige and Daniel, thank you so much for the opportunity to be a part of your special day, it was an absolute pleasure.